Let me paint a scene for you. It's a gloomy morning, my coffee has gone cold and as the rain putters against the window in front of me and the Pinterest inspiration is deflating, I can only look to my dog who is content and asleep at my feet. Do you ever have those bleh days? These are the days where I expect the least and end up discovering the most. Randomly I clicked on the Quotes section in pinterest, cheesy I know. Of all of the pins, the first one was a quote from the genius, Tina Fey. 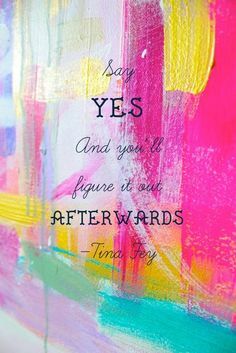 "Say yes and you'll figure it out afterwards". What a breath of fresh air this quote is! Things that scare us, things that we consider but never get to for whatever reason (or excuse) we need to start saying "yes" to. Saying yes, committing to it, and doing it. My mom shed some advice onto me, when something goes wrong give yourself a certain amount of time to get over it and then simply, be over it, that way you can get to saying "yes" more, and more. I have had struggles that could leave me upset for days, but I choose not to let them. Setting that time for yourself, whether it be an hour or a week, is a radical way of getting control of your life. You can start saying "yes" more and stop letting the "no's" and negatives weigh you down. I do realize that 2014 is more than half way over but I am going to consider that even more of a challenge for myself. Saying "yes" more often and setting a goal to say "yes" to at least five things that frighten me by the end of this year. It is all about baby steps, whether it is wearing skinny jeans when you normally where boot leg, a hair transformation or joining a book club. We can do this!